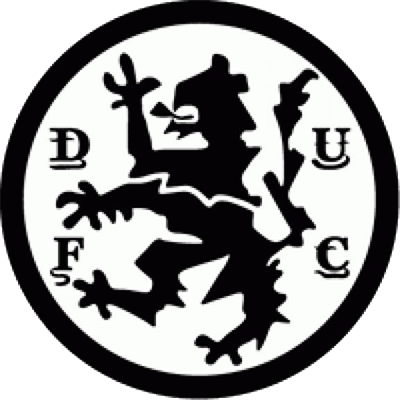 After defeating Winterslag back in December to qualify, United appeared in their first ever European quarter final. 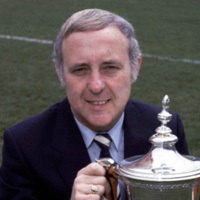 Manager Jim McLean made two changes for the match against the tough Slavs of Radnicki, with Maurice Malpas and Davie Dodds coming in for Derek Stark and Graeme Payne. 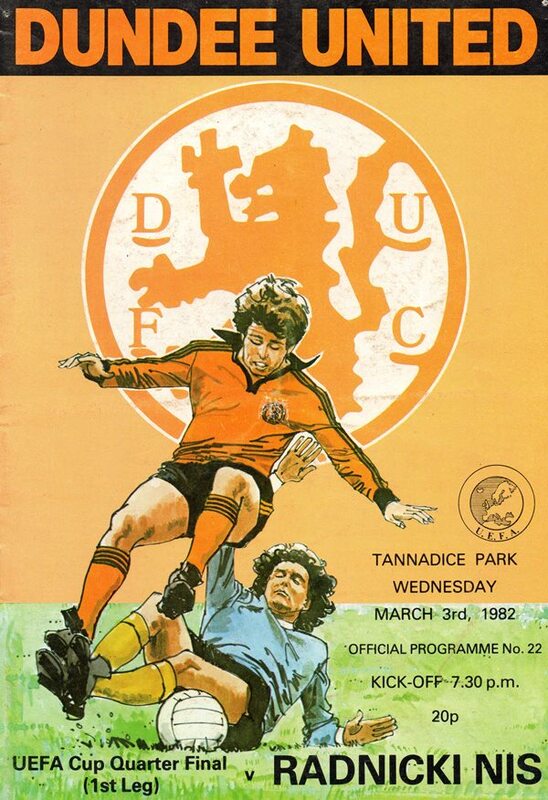 United started well, responding to the eager encouragement of the Tannadice crowd, with John Holt firing over after a Paul Sturrock cut-back. Radnicki threatened soon after, with Savljevic seeing his shot deflected past the post. Dodds and Holt then both had chances created by the lively Ralph Milne, with the former having his effort blocked, and the latter driving well past the post. 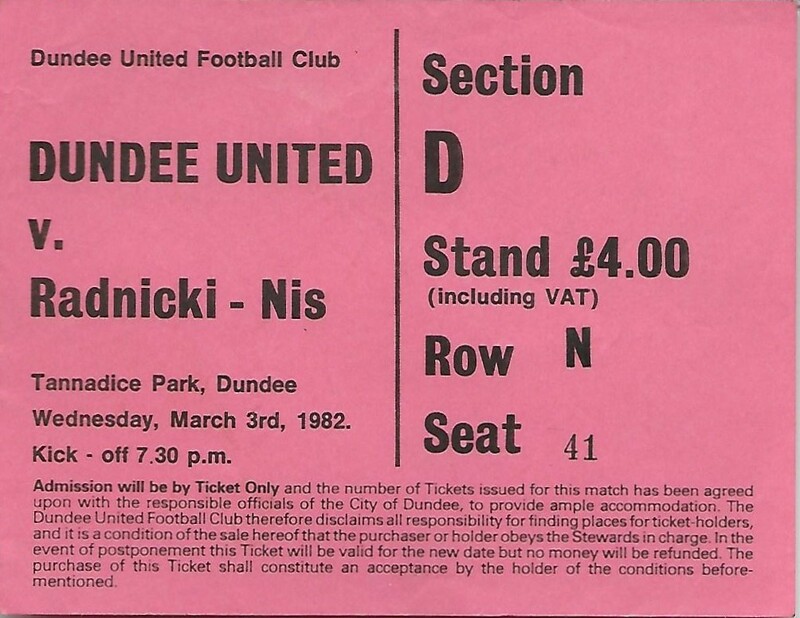 An impressive spell of home pressure began with Dave Narey shooting just off target, then Richard Gough had a shot stopped by Zoran Milenkovic in the Niš goal. The referee then awarded United an indirect free-kick 12 yards out after dangerous play, but Eamonn Bannon lofted over after Billy Kirkwood's lay-off. United kept the pressure on and the goal eventually came in the 41st minute. Bannon's corner form the left was partially cleared but Dave Narey fired in an unstoppable shot from the edge of the box, giving United the lead as well as their fiftieth goal in Europe. United's pressure was rewarded by a second goal two minutes later. The Yugoslav keeper dropped a simple cross and from the ensuing Eamonn Bannon corner Davie Dodds met the ball square on to bullet home a header. Sturrock almost gave United the perfect start to the second half but he mishit his chip shot leaving the goalkeeper scrambling back to see the ball slide past the post. Dodds then went close with a left foot shot as United, witht the gale at their backs, went for more goals. Milenkovic saved again from a Dodds header, and from the corner Paul Hegarty's header hit the bar and went over. The keeper then had a miraculous save from Kirkwood after Sturrock had laid the ball into the midfielder's path, and produced yet another fine save from a Bannon effort. Bannon was frustrated again when Milenkovic pushed away his fierce free-kick, and with eight minutes to go another Bannon free-kick finally beat the keeper, but rebounded off the post. 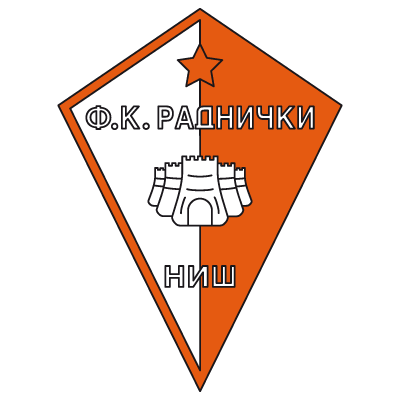 Four minutes from time Hamish McAlpine stopped a Milosovic shot during a rare Radni?ki Niš attack. Having scored five goals in each of their previous two home European performances, it was slightly frustrating that United's all out attack failed to deliver the third goal which their play undoubtedly deserved. With one foot in the semi final draw, the 2-0 victory left United with a little bit to do in the second leg. has been reached and we're flying the flag for Scotland as the first club to make the last eight since the Fairs Cup was changed into the present UEFA competition. Before the match gets under way let me make a signing offer to each and every one of you - for I believe that your contribution tonight can be a vital element in our effort to reach the semi-final. Unlike previous rounds, we have to approach the task with the first leg here at Tannadice, a result of the ballot which places new and totally different emphasis on our approach to the match. Your marvellous support was a crucial spur early in the games against Borrussia and Winterslag which had us going in at the interval with a 2-0 lead over the West German side and a three goal advantage over the Belgians. The hard work was done by the half-time stage in those earlier ties and hopefully we will be in a similarly happy position tonight but everyone concerned must be aware of the possibility that we may have to wait a little longer for the breakthrough. Walter Smith watched our opponents in Titograd on league business ten days ago and although they went down 2-0 he saw enough in their organisation at the back to know that they will be difficult to break down. This is where your patience during the game can be absolutely vital. The atmosphere will be electric and players can momentarily respond to the highly charged situation and that's when teams are vulnerable. I am certain if you can give them your loudest and best encouragement come what may the players will take that lead and work at the task in the right way. Goals are goals, whether they come in the final five minutes or the last five and I ask you to join the players in making sure that we get the desired outcome come ten past nine.